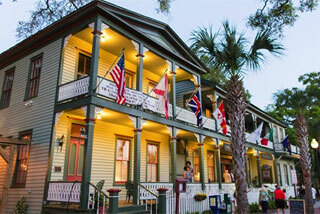 The Florida House Inn sits in the heart of Fernandina’s historic district, where quaint shops and romantic restaurants complement the boutique hotel’s 17 lavish rooms and distinctive suites. Guests are invited to enjoy southern style breakfasts in our private dining room and enjoy happy hour with tasty cheese & house seasoned nuts served during evening reception held in the Mermaid Bar. Discover the secrets of Fernandina Beach & Amelia Island while experiencing the culture of the area at regular festivals, gallery openings, farmers markets and outdoor adventures that welcome tourists and residents alike. The Hoyt House Inn is your exclusive Amelia Island ultimate, intimate, luxury Inn that will exceed your expectation with our perfect blend of romantic elegance, comfort and southern hospitality. From luxurious guest rooms to perfectly conceived and presented breakfasts. Our made to order 3 course gourmet breakfast is the only Bed & Breakfast on Amelia Island that offers a true culinary experience . 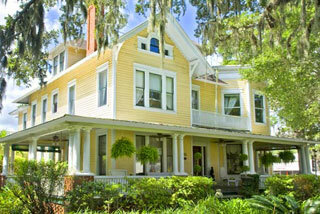 The Hoyt House stands apart as a unique full service Boutique Hotel & a Select Registry Property on Florida’s breathtaking Amelia Island.